Have you recently been wistfully wondering what the Romney boys are up to? Do you constantly find yourself shouting "free market!" at family dinners? Are you considering auditioning as a villain for the next Muppet movie? And are you also watching Downton Abbey? All these things might have more in common than you think — at least according to Fox & Friends who are claiming that Downton has been secretly working as right wing propaganda this entire time. Good thing I'm sitting so close to my fainting couch — oh, my god, I bought a fainting couch. It's too late for me, friends! British economic journalist Stuart Varney appeared on yesterday's Fox & Friends to expose how Downton has been slowly indoctrinating us to right wing ideology. "Rich people, powerful people in America are reviled," he tells the co-hosts. 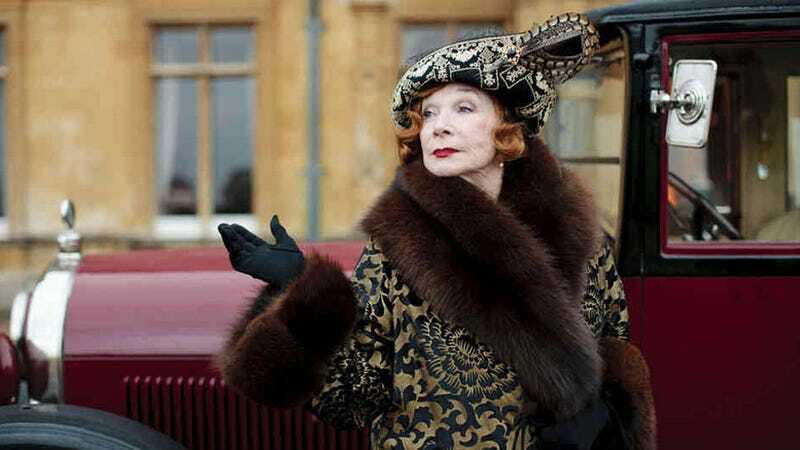 "They're dismissed as fat cats who don't pay their fair share...And yet along comes this show called Downton Abbey — rich people prominently featured and they're generous, they're nice people, they create jobs for heaven's sake...and we love them...It poses a threat to the left. The left says, 'You gotta hate these people,' but popular America watches a show that says these people are okay." And on PBS no less! Co-host Gretchen Carlson asks, "Could it also be the theory that people are just sick and tired of the stupidity on reality TV and they like watching something that brings about beautiful pictures of relatively smart people talking about historical eras?" Even if it sounds like a sentence put through Google Translate, that's a great question, Gretch! But shut up. You're missing the point. "The entire town loves the rich guy who lives in the Abbey," says Steve Doocy. "Because he provides the jobs, he looks out for everybody, he has free medical care for everybody and without him...the place would go belly up." Okay, a few things. Leftists love rich people. Look at George Clooney. He's rich and we're crazy about him. But on to Downtown and specifically Lord Grantham, the "rich guy." According to Fox & Friends, viewers love him because he provides jobs and universal healthcare for everyone in the village — both of these are leftist ideas. And as a final point of contention, the place has gone belly up — Lord Grantham has run Downton Abbey into the ground. Now, I'm not arguing that Downton Abbey is by any means leftist (I am quickly losing steam caring about whether or not the Crawleys have to move into a slightly smaller mansion with a slightly smaller staff of servants). What I am arguing is that a trickle down economy is the best economy! Sorry, I guess Downton has really gotten to me after all.